The Triumph Bonneville T120 is a 650cc, twin cylinder, four stroke, street motorcycle manufactured by Triumph from the 1960s through 1970s. The Bonneville T120 was Edward Turner's last production design at Triumph (in retirement Turner designed the Triumph Bandit/BSA Fury which did not pass the prototype stage before BSA went under). The new motorcycle was conceived and developed so quickly that it was not included in the 1959 Triumph catalogue. With a 649cc parallel-twin (two-cylinder) engine the T120 was based on the Triumph Tiger T110 and was fitted with the Tiger's optional twin 1 3/16 in Amal monobloc carburettors as standard, along with that model's high-performance inlet camshaft. Launched in 1959 by Triumph as "The Best Motorcycle in the World", the Bonneville T120 was aimed mainly at the lucrative US market where enthusiasts were demanding extra performance. Initially produced with a pre-unit construction engine which enabled the bike to achieve 115mph without further modification, the power tended to induce high speed wobbles from the single downtube frame, so in 1963 a stiffer and more compact unit construction model was introduced, with additional bracing at the steering head and swinging arm. The steering angle was altered and improved forks were fitted a couple of years later, which, together with the increased stiffness enabled overall performance to match that of the Bonneville's rivals. In 1967 Triumph posted its most successful year in the United States with an estimated 28,000 T120s sold,. In 1968 the T120 gained a new and more reliable ignition system. From 1971, T120 models used a new frame which contained the engine oil instead of using a separate tank (this became known as the oil in frame/'OIF' version). 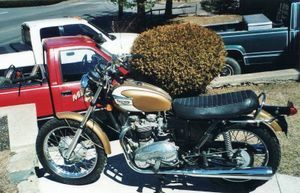 A five-speed gearbox finally was fully available by 1972, but competition from larger-capacity motorcycles led to the T120 being superseded by the 750 cc Bonneville T140. Production of the 650 continued until 1973, when the workers at Triumph's Meriden headquarters staged a sit-in until 1975. In 1974 fewer than 1000 of the 650cc assembled machines were released by the workers, with another 38 in 1975. Production of the T120 was not resumed following the sit-in, the Meriden Motorcycle Co-Operative created after the dispute concentrating upon the 750cc twins instead. For 2016 a host of updates have been made for the 2016 T120 model a displacement increase to a all new 1200cc engine and the addition of liquid cooling and the change from a 360° crank to a 270°. To retain the 'retro' styling the fuel injectors are hidden behind throttle bodies designed to resemble carburetors. Along with the fuel injection it has ride by wire and traction control, 2 Riding modes and all LED lights and also heated grips. T120R – Export model intended for the US market with in varying years, varying differences. T120V - 5-speed model available 1972. T120C – Competition model with high-level exhaust pipes. T120TT – 1964 model of the T120C for the US East Coast. In 1968 Evel Knievel jumped the Caesar's Palace Casino fountains on a Bonneville T120TT, and was seriously injured breaking many bones after losing control on landing. T120RT – A special 750 cc model which had Routt 750cc cylinder kits installed in America by Triumph to permit them to be used in American Motorcycle Association production-based racing events. The kits were installed on new T120R models while still crated. To qualify, motorcycles had to be made and sold to the public in the same form as they would be raced. 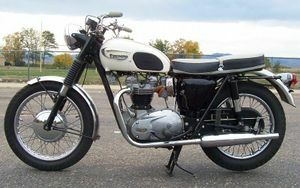 Triumph had to produce and sell at least 200 of them before they qualified, and although the exact number sold is not recorded they did meet the requirement. The T was stamped separately on the engine cases in America after the stock T120R when the modifications were made, the frames were not stamped. T120RV - The 5-speed is generally considered to have been available—and was advertised as such—starting in 1972 with the T120V. However, a small pre-production run of 5-speeds were made in June 1971 only, and sold as '71 models. 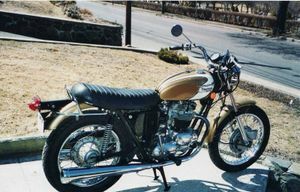 They were externally identical to their '71 T120R 4-speed counterparts, and did not carry any "V" decals such as the 1972 5-speeds displayed on their side panels. They were factory (not dealer) modified T120R models, so their engines/frames/and titles are designated T120RV,with the V being stamped separately when the transmissions were installed. These early factory Triumph 5-speeds are not to be confused with the Quaife 5-speeds that were listed as stocked for sale by Triumph dealers in 1970 to qualify for AMA purposes (the parts "had to be available from Triumph"). The first and final T120RV ratios in 1971 were the same as the 4-speed model, making it a matter of closer ratios, unlike later 5-speeds. These 5-Speeds were not advertised, were not available as an option, and could not be ordered—as the few manufactured were simply distributed individually to selected Triumph dealers and sold by word of mouth. The first race the Triumph Bonneville partook in was the 1959 Thruxton 500. Entered by Triumph Dealers with bikes supplied from the factory. In this first race they finished 2nd (behind a BMW) and 4th heralding the beginning of a successful era of Triumph motorcycle racing. The T120 won the Production Isle of Man TT in 1967 and 1969. The re-introduction of the Production TT had just taken place in 1967 when John Hartle took first place on his Bonneville. Two years later in 1969, Triumph set a new landmark in TT history when Malcolm Uphill averaged Template:Convert around the Mountain Course on a Bonneville. Uphill’s achievement was the first time that a production motorcycle had ever passed the three-figure mark from a standing start. Following Uphill's record the Dunlop K81 tyres he was using were renamed 'TT100's. In 1962 Tony Godfrey and John Holder rode T120 Bonnevilles to victory in the Thruxton 500 mile endurance race, and an article in The Motor Cycle entitled "Thruxton Triumph by Bonneville" led to the development of the Triumph T120R 'Thruxton', which was hand-built by a team of Triumph technicians using specially picked components and precision-machined cylinder heads and crankcases. Peak power was increased and each 'Thruxton' engine was bench tested to deliver around Template:Convert at 6,800 rpm with a safe rev ceiling of 7,200 rpm. Only around 55 of the Thruxton T120Rs were built in 1964/5 to meet homologation requirements for production racing, and surviving examples are rare. About 100 more machines were subsequently manufactured and supplied to selected dealers and riders. Further examples were also built by dealers, with the factory's approval, from factory supplied parts. 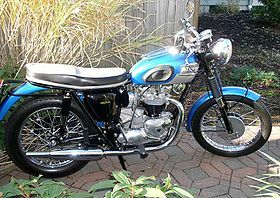 In 1969, Bonneville T120 bikes achieved the first three places in the Thruxton 500. Percy Tait and Malcolm Uphill finished first in the Thruxton 500, ahead of two other Triumph T120Rs. In 2012, Marc LaNoue set a Vintage class record at the Pikes Peak International Hill Climb. The Bonneville name came from the achievements of Texas racer Johnny Allen on the Bonneville Salt Flats in Utah. In September 1955, Allen had achieved a two-way average speed of 193.3 mph (311 km/h) on his special motorcycle the "Devil's Arrow", a 650 cc twin-cylinder Triumph engine fuelled by methanol in a unique 'streamliner' fairing. Allen's speed was ratified as a record by the American Motorcycle Association but not by the world authority, the FIM, as no official observers were present. German motorcycle firm NSU took the record the following year, so Allen and his team returned to Bonneville in September 1956 and won it back with an average speed of 214.17 mph (344 km/h). The FIM also refused to accept this as a world record but Triumph gained much needed publicity from the legal dispute that followed. After the Bonneville T120 had been named in recognition of Allen's records, other Triumph-engined motorcycles went faster still on the Salt Flats. In 1962 Bill Johnson set a two-way average of 230.269 mph (370.5 km/h) over a measured mile, riding a 667 cc 'streamliner' whose design was based on the American X-15 rocket plane. In 1966 Detroit Triumph dealer Bob Leppan raised the record to 245.66 mph (395.3 km/h) with his Gyronaut X-1, powered by two 650 cc Triumph engines. For the next few years, Triumph fitted Bonneville roadsters with "World's Fastest Motorcycle" stickers. ↑ 1.0 1.1 1.2 1.3 1.4 Kemp, Andrew; De Cet (2004). Classic British Bikes. Mirco. Bookmart Ltd. ISBN 978-1-86147-136-9. ↑ Bonneville T120. Triumph. Retrieved on 10 December 2016. ↑ 1965 Triumph T120 Bonneville. Retrieved on 2009-02-21. ↑ Brown, Roland (1999). The History of British Bikes. Parragon. ISBN 978-0-7525-3153-3. ↑ The Triumph Bonneville. Retrieved on 2009-02-21. ↑ The History of British Motoring, 2007. pp.166–167. ↑ Neale Bayly (March–April 2011). 1967 Triumph T120 Bonneville. Motorcycle Classics. Retrieved on 2011-03-07. ↑ 10.0 10.1 Triumph's Bonneville Connection. Archived from the original on 11 October 2014. Retrieved on 2009-02-22. ↑ 1971 Triumph 650cc Bonneville T120RV. Archived from the original on 8 April 2009. Retrieved on 2009-02-22. ↑ TT FactZone Meetings 1951-1970: TT 1969. iomtt.com. Retrieved on 2016-06-23. ↑ Triumph's Return to Isle of Man. webbikeworld.com. Retrieved on 2015-12-20. ↑ McDiarmid, Mac (2007). The Magic of the TT. Haynes Publishing. ISBN 978-1-84425-431-6. ↑ 15.0 15.1 Vintage Mann Magazine (September 2015). Retrieved on 22 June 2018. ↑ 16.0 16.1 Origins of the Triumph Thruxton 900 - Classic British Motorcycles - Motorcycle Classics (en) (December 2005). Retrieved on 22 June 2018. ↑ 17.0 17.1 Triumph Thruxton. Retrieved on 2009-02-22.